Flush (with no protrusions) and can be made near invisible. 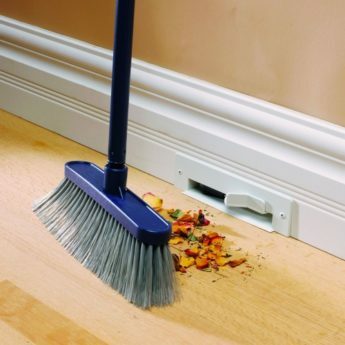 Eliminates injury and damage to the dustpan with no protruding levers. Easier opening and closing with flip/flop door. Totally sealed front door (vermin proof) with a dual rubber seal (bottom & back) and tension spring which provides a higher seal integrity. Greater air flow speed in the chamber which increases suction power. Now easier to customise (DIY paint your own special colour if needed). In-built design of dustpan caps to hide the screws. Easier to install with the increased size in the cut out and you can now pipe extra dustpans without having to cut inspection openings.